Mumbai traffic police on Wednesday issued an e-challan to actor Kunal Khemu after the latter tweeted a picture in which he could be seen riding his superbike without wearing a helmet. Earlier today, Khemu took to his micro-blogging account to acknowledge his mistake of riding a bike without wearing the necessary gear, including and most importantly, the helmet. “I have seen this picture out there and honestly it’s very embarrassing given I love bikes and ride regularly and always with a helmet and some more gear but whether it’s a long ride or just next door a helmet should always be worn. Apologies I don’t want to set the wrong example!” the actor tweeted. While Khemu clearly shared the picture with the intention of acknowledging the error in judgment, it didn’t take long for Mumbai traffic police to take note of the violation and respond to the Golmaal actor. “@kunalkemmu You love bikes, we love every citizen’s safety. And we wish a regret could avert mishaps! Hope next time the realisation won’t be an afterthought! 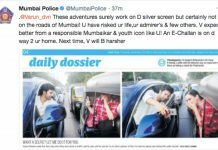 An e-challan has been dispatched,” Mumbai police tweeted from its official handle. Traffic police subsequently issued an e-challan for violation of section 129/177 (riding without a helmet) of the Motor Vehicle Act. The challan, which carried a Rs 500 penalty, had already been paid at the time of publishing this report. The bike, an MV Agusta Brutale 1090 RR, is incidentally registered in the name of Khemu’s brother-in-law Saif Ali Khan. Back in November, traffic police had also issued an e-challan to actor Varun Dhawan who had violated traffic rules by taking an impromptu selfie with a fan in traffic.